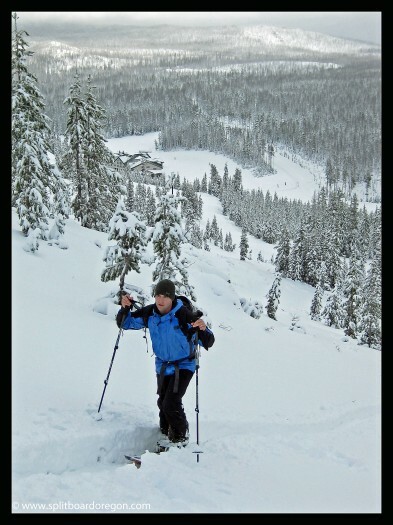 Even though the brunt of the storm was tracking north into the Washington Cascades, Andy, Todd and I decided to head to Hoodoo to check out the conditions instead of driving further to Bachelor and the Cinder Cone. This would be our first outing of the year in search of the fresh stuff. Our local backcountry spots didn’t have enough snow have enough snow to ride safely yet, but the telemetry at Hoodoo showed 18 inches of new snow. Would there be enough to ride? We arrived at the gate to find it closed, but conditions looked good, so we loaded up the gear skinned towards the parking lot. 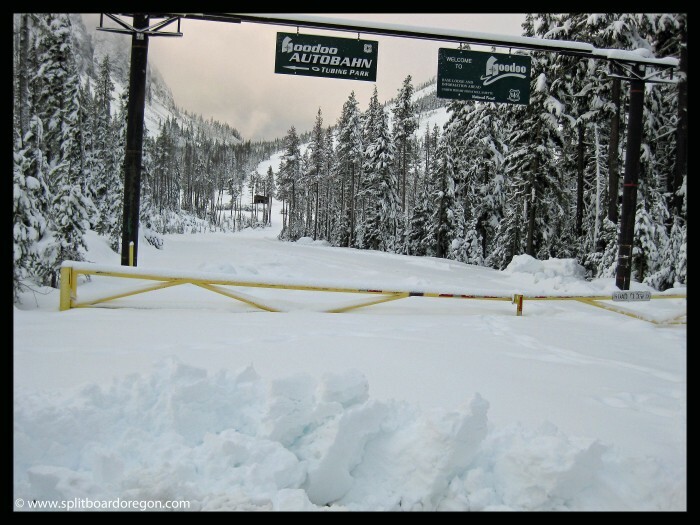 Fresh snow and a closed gate – a great sign! We started skinning and it didn’t take long to realize that we were going to have a good time. 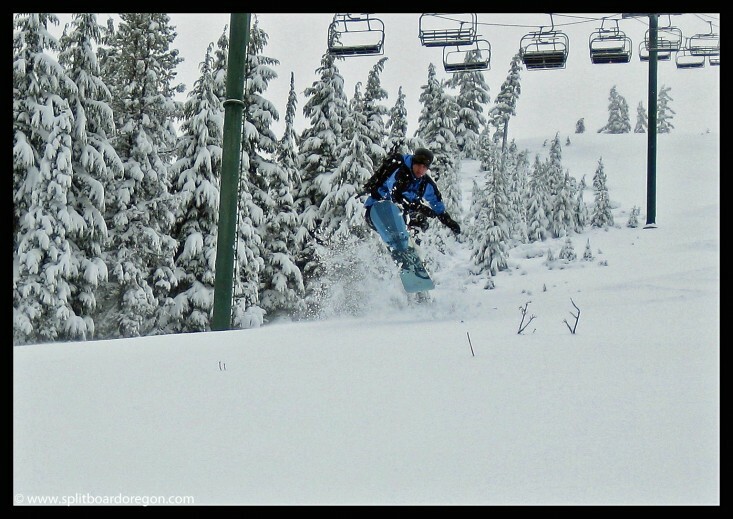 The snowpack was about 20 inches deep, and it felt good to skin over the soft fresh early season powder. This was the second trip with my homemade Burton Custom split, and it performed great. Early season conditions are what I really made this board for! We skinned to the top of the Ed chair and decided to not proceed all the way up to the top of the mountain because the coverage in the bowl was a little sketch. 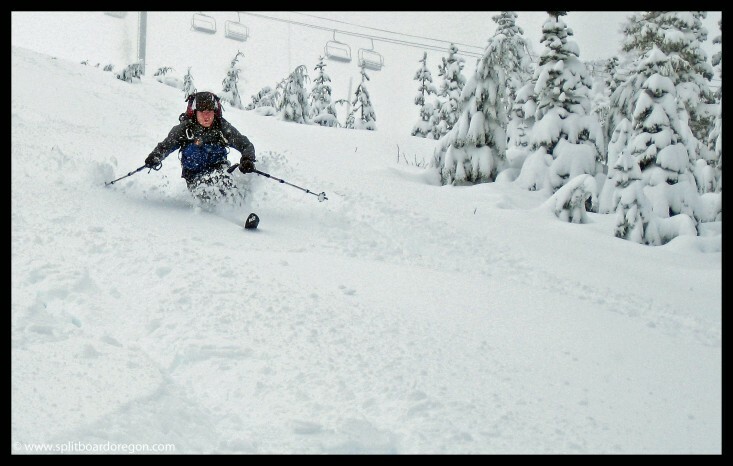 After changing over to ride mode, we strapped in and made the first powder turns of the season! We made several laps under the Ed chair and each run was really nice. The forecast for the coming week is for more snow, so it might continue to be good! Lovin’ the early season fresh!